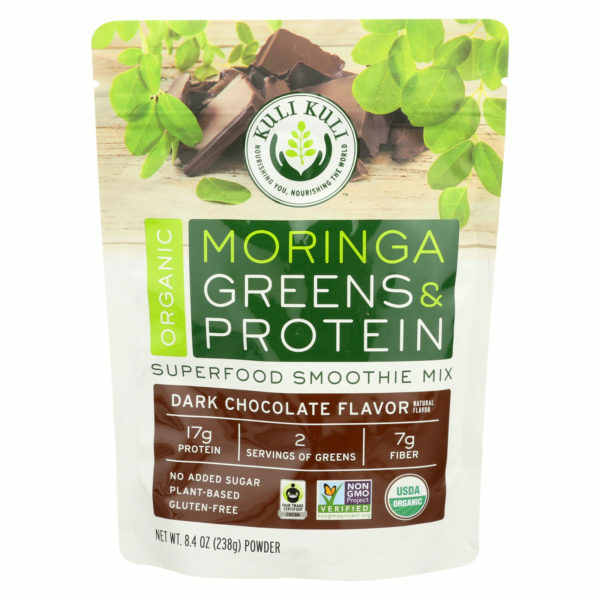 Kuli Kuli Moringa Greens & Protein – Dark Chocolate – Is A Superfood Drink Mix. Each 8.4 Oz. Pouch Of Mix Is Made With Powder From The Moringa Plant, Which Contains Twice As Much Protein, Three Times As Much Calcium, Twice As Much Iron And 1.5 Times As Much Fiber As Kale. Our Superfood Drink Mix Is Non-Gmo And Is Made From Simple, Organic Ingredients. This product is a good source of calcium, iron, fiber and protein that is easy to use on the go for breakfast and in smoothies to get your greens in a convenient way with pure plant based proteins. Moringa powder is created by harvesting, drying, and milling moringa leaves. As simple as that sounds, soil quality, harvesting practices, and processing procedures create varying levels of cleanliness and quality. Third party research has found that Kuli Kuli’s Pure Organic Moringa Powder is the cleanest on the market. ​Harvesting only moringa leaves; the most nutrient dense part of the tree. Maintaining direct relationships with family farmers and women’s cooperatives around the world. Strict standards when evaluating suppliers. Temperature controlled drying for safety, nutrient density, and consistency. Inspected and packed in the U.S.A. The three nutrients that pregnant women need most are calcium, iron and folic acid. Moringa is commonly used to supplement these minerals as well as B vitamins and protein for pregnant and breastfeeding mothers. While supplements should always be discussed with your doctor, moringa can be an excellent way to add a boost of these nutrients to each meal you prepare, as one tablespoon of the dry leaf powder can provide about 50% RDV iron, 15% RDV of calcium and 5 ug of folic acid. You can add moringa powder to anything, from smoothies to savory dishes to your baby’s mashed bananas, for a nutritious burst. The suggested daily serving of Moringa Powder is six tablespoons for a nursing mother, and three tablespoons for a child of one to three years. Diabetes is a metabolic disorder that impairs glucose tolerance and leads to a high risk of cardiovascular disease. Previous studies conducted in both animal and human subjects have found the leaves of the Moringa Oleifera tree reduce blood glucose levels and thus beneficial to those with diabetes. Moringa’s richness in antioxidants lends itself well to protecting the body from the effects of diabetes. The regular intake of moringa and other potent antioxidants is recommended to protect against oxidative damage. Dyslipidemia, or abnormal amounts of lipids, including both cholesterol and triglycerides in the blood is a condition that affects millions of people in the United States. High LDL cholesterol and triglycerides in the blood can lead to a buildup of plaque in the arteries, increasing the risk of cardiovascular disease. In both human and animal studies, moringa has been shown to lower levels of harmful blood lipids while simultaneously raising HDL cholesterol levels. The antioxidant and free radical scavenging properties of moringa give way its cardioprotective capabilities. Previous studies has proven that moringa can lower harmful cholesterol and reducing the risk for cardiovascular disease. Moringa also naturally blocks antihypertensive and calcium. Maintaining a healthy heart requires a protective diet. These studies have proven moringa can contribute to protection of the heart and is an excellent way to integrate high quality nutrition and valuable antioxidants into a heart-healthy diet. KULI KULI’S MISSION IS TO IMPROVE NUTRITION AND LIVELIHOODS WORLDWIDE THROUGH MORINGA. OUR VISION IS TO WORK WITH WOMEN-LED FARMING COOPERATIVES ALL OVER THE WORLD TO DRIVE ECONOMIC GROWTH, WOMEN’S EMPOWERMENT AND SUSTAINABLE AGRICULTURAL DEVELOPMENT. WE ARE CREATING A WORLD WHERE EVERYONE HAS THE RESOURCES AND KNOWLEDGE TO ACCESS THE NUTRITIONAL POWER OF MORINGA. BY REJUVENATING MORINGA AS A TOOL FOR NUTRITIONAL SECURITY, WE HOPE A NEW GENERATION WILL IMAGINE A WORLD WITHOUT HUNGER. Kuli Kuli is America’s leading moringa brand. We provide the highest quality and most nutritious moringa available. Kuli Kuli’s moringa is rich in iron, calcium, vitamins, and antioxidants. Our moringa provides a complete protein with all 9 essential amino acids. By hand-harvesting only fresh, young leaves, Kuli Kuli ensures that our organic moringa powder is more nutrient-dense and less bitter than anything else on the market. Taste the Kuli Kuli difference. Over 60% of Americans say that incorporating more vegetables/greens into their diet is their #1 priority but many find it difficult to get their greens at meals other than dinner. Kuli Kuli’s delicious Moringa Superfood Bars, Pure Moringa Powder, Energizing Moringa Herbal Tea, and Moringa Green Energy shots make it easy for Americans to get their greens on the go while helping to plant moringa trees and support women farmers in the developing world. Kuli Kuli’s founder Lisa Curtis got her first taste of moringa as a Peace Corps volunteer in a small village in Niger . As a vegetarian, she was eating mostly rice and millet — a diet that left her feeling sluggish. When she mentioned her fatigue to women at the community health center, they suggested she try moringa. She bought moringa leaves from a neighbor’s tree and mixed them with a popular peanut snack called kuli-kuli. She soon felt better and began to work with villagers to encourage them to use moringa. Lisa founded Kuli Kuli to help women in West Africa use more moringa locally and earn a sustainable livelihood by selling a portion of each harvest to the US. Ingredients : Organic Moringa Leaf Powder, Organic Pea Protein, Organic Alkalized Cocoa Powder*, Organic Brown Rice Protein, Organic Natural Flavors, Salt, Organic Guar Gum, Organic Stevia Leaf Extract, Sunflower Lecithin.